Through a series of distinct sequences, LEAP observes a range of physical and psychological moments in the quest for a moment of perfection. 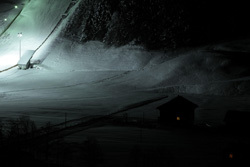 Based around an annual worldcup event and set on the world’s largest natural skijump the material for LEAP was filmed during December 2010 in the high alpine valley of Engelberg, Switzerland. Inspired by Werner Herzog’s film ‘The Great Ecstasy of Woodcarver Steiner’ (1974), Manchot’s film charts the intense preparations for the event at close range, both in terms of the physicality of the site and the individuals involved. Installed to create a dialogue across the gallery’s spaces, the video develops across a set of precise short episodes, each with its own structure and filmic logic. Rather than pursuing an overarching narrative, the film progresses through elliptical observations, portraits of a place and of people. Setting its focus prior to and behind the scenes of the dramatic moment, the jump, the work circumvents narrative expectations and reverses the dynamic of cinematic tension. 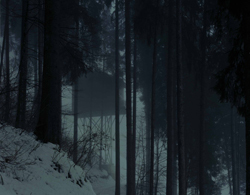 Hence while the film observes in great detail those elements that contribute to the construction of a large scale event, at its core it is concerned with the psychology of perfection, the obsessive focus required to attain ten seconds of human flight, to briefly defy gravitational pull. Through a series of images and tableaux, the film gives a sense of the ambitions that lie behind both the event and the various groups of people that create it and participate in it, over and over, year after year. Alongside the video-work, Manchot has produced a new series of photographs that look at the site, portraying the location like a character. 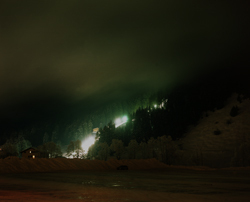 Photographed during nightfall and at night, when all activity on and around the site ceases, these images foreground the location, giving it duration and attention. Here the mixed light, fading daylight merging with glowing floodlight, speaks of the tensions and connections between nature and artifice, between the extraordinary and the everyday. As with many of Manchot’s project’s it is in the relation between still and moving images that the meanings of a body or work are fully developed.